Firstly, apologies for my last post. Barry Manilow. What was I thinking? I shouldn’t do that to you, dear, faithful readers. I’m sorry. It won’t happen again. Leg Specialist Lady has ordered an x-ray to make sure there’s no fractures in my foot which are impeding and biting into my tendons. I have some tendons on the point of collapse. Actually, the other way round. I know I should be grateful that all these doctors and clinics are properly wanting to get to the root of the problem, and I can see someone, like, the next day. But all I really want is a dodgy doctor from Buenos Aires* who would make something up to make me feel better and let me run. Gently, but run none-the-less. Anyway, I had already decided I was going to try out my local Zumba class that night. I have never done Zumba. I thought: Zumba isn’t running and if it hurts, I’ll stop. Let me explain something here. I HATE aerobics classes. I think they are silly and boring. But, part of me wanted to check out something in my new town of Wasserbillig, test my language abilities (would the class be in Luxembourgish, German or French?) and do something to mix up my fitness. Turns out I didn’t have to worry about the language issue. The teacher didn’t even speak. There were Chinese, Portuguese, German, Luxembourgish there (plus me), so I don’t think any one language would have worked. Instead, she cranked the music up and flung herself about the place with such gusto, we just had to follow. Zumba was created in the 1990s by a Colombian aerobics instructor, Alberto Perez, who had forgotten his workout tapes and had to use other music he had with him, which consisted of salsa and merengue tunes. This totally worked out and people loved it. He then went to the States, hooked up with a partner, sold it to the world and (I imagine) became loaded. Good for Alberto. And good for me. Zumba is a lot of fun. Firstly, the music is the type I prefer on a night out, and being able to listen to tunes I danced to in my favourite Cuban club in Buenos Aires is a massive bonus. Secondly, it’s not like an aerobics class. It’s more like a dance floor and doing your own thing is totally cool. I tried to follow the teacher to the step, but you know, if I didn’t move my arms in the right direction, who cares? I was moving my arms. One little lady in front of me was completely hopeless, but she kept moving the whole time, dancing on her toes and swaying her hips. So what if all her steps were the same? When we twizzled, she did too. Just the wrong way round. Lastly, Zumba is knackering. I was wondering after 20 minutes if I was going to make the full hour without turning into a sweaty mess on the floor. But then there’s the one good thing about a class: you look around you and see older, fatter, redder people and think If they can keep going, I can too. It’s stupid aerobics pride. But it keeps you going. I have signed up for the year. 80 Euros for a year’s worth of classes is a bargain. Those darker, longer winter nights are going to be upon us soon, and I think some fun, high tempo exercise is the tonic to that. It doesn’t mean running goes out the window, of course. You’ve got to mix it up. This way I get the Zumba beat and the running buzz. And you can’t beat that. Zumba: Highly recommended. Good for: Everyone. Doesn’t matter if: You have zero rhythm. Helps to: Love Latino music. *For the record, no doctor in Buenos Aires ever did that. Unfortunately. 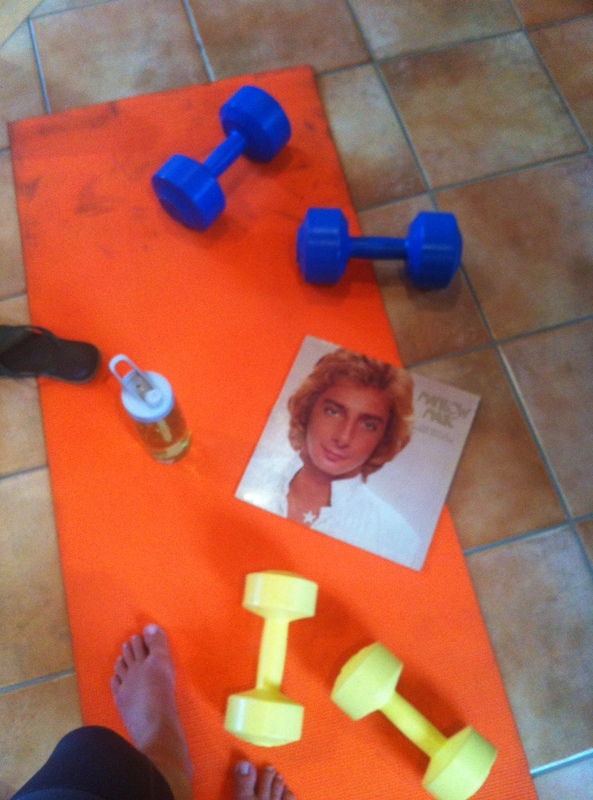 The Barry Manilow Workout: Take one orange yoga mat and add weights of various sizes. Then, do squats, side bends, abs and obliques, planks, The Downward Dog, The Tree. You can also lift said weights in all sorts of ways. This, of course, all to Mandy, Copacabana, Looks Like We Made It and all those Barry classics we know and love. Record player not supplied. WHERE IS REMICH?! I hear your cry. Well, go back a few posts and you’ll see this half of M&MRC now resides and runs in Luxembourg. And before you cry out that yes, you’ve heard of it, and you think it might be near Paris/Poland/Palermo here is a little map. Just so we’re all on the same page. So, landlocked yes I am. But far from water I am not. 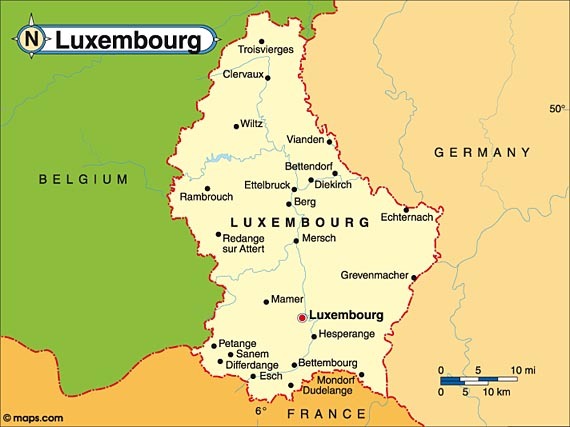 For we are now living along the Moselle river, which borders Germany (the lower half of that frontier on your map above) and heads on into France. Remich is a town further south along the river. It is another picturesque little place of around 3,000 inhabitants that basks in its vineyards and wine-making glory. So, where better than to do a half marathon? I can think of none. 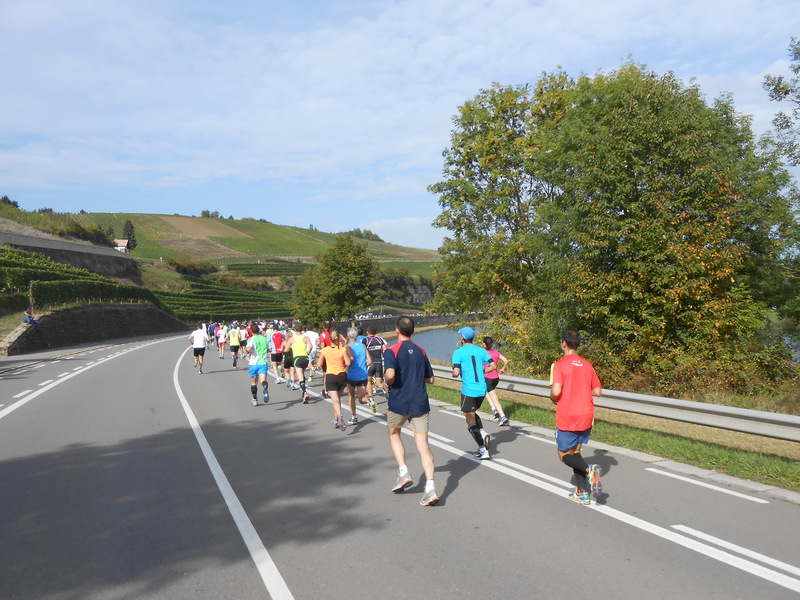 The route itself follows the Moselle, so it’s beautifully flat. On one side you have the river and Germany’s rolling hills opposite; on the other side are slopes of vines, bursting with green, their rows straight and perfect. 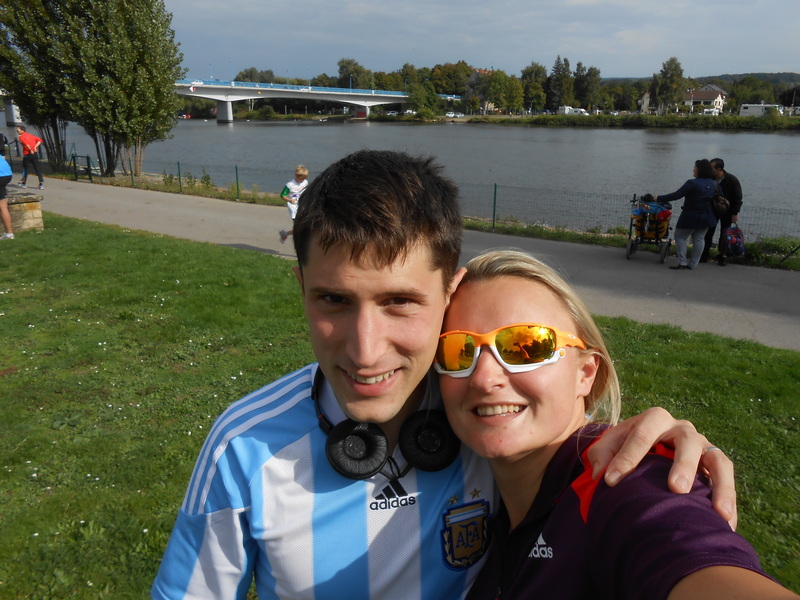 This year was Remich’s 52nd half marathon. 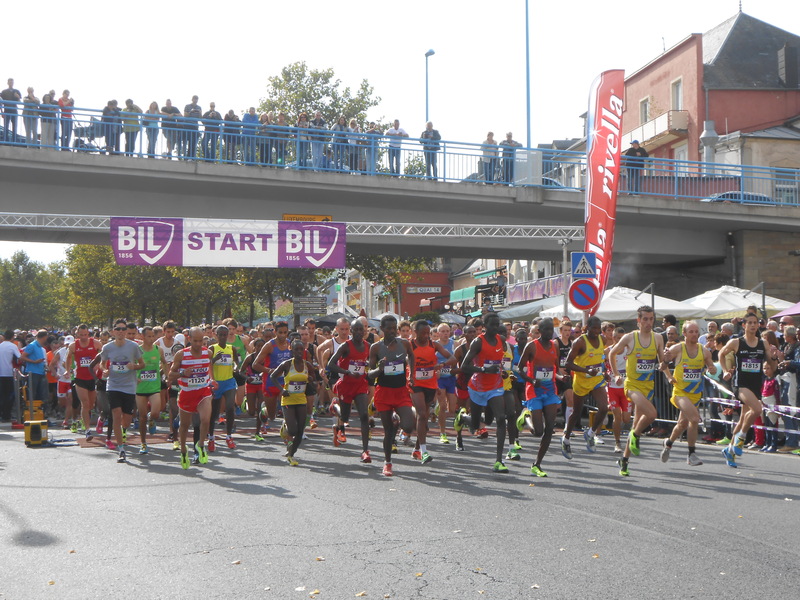 Other good things before the starting gun: you get a bottle of local champagne and some fruity booze-free beer; and there are only about 2,000 runners so you can park easily, see supporters easily and easily not get lost. 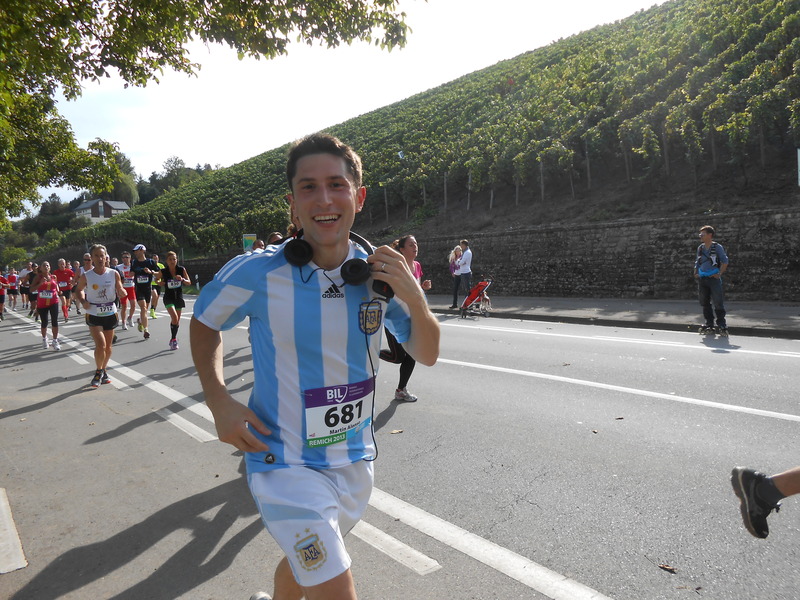 My Achilles injury prevented me from training for it, so Martín was running solo. Not getting lost in the crowds is an important point to make, if you know Martín. So, I was there with my bike and became Professional Supporter, cycling up ahead to take pictures, make videos and clap. There was plenty of room for me to do this, pedalling alongside the runners while shouting and filming. I thought about stealing a judge’s sign for my bike I was so on it. 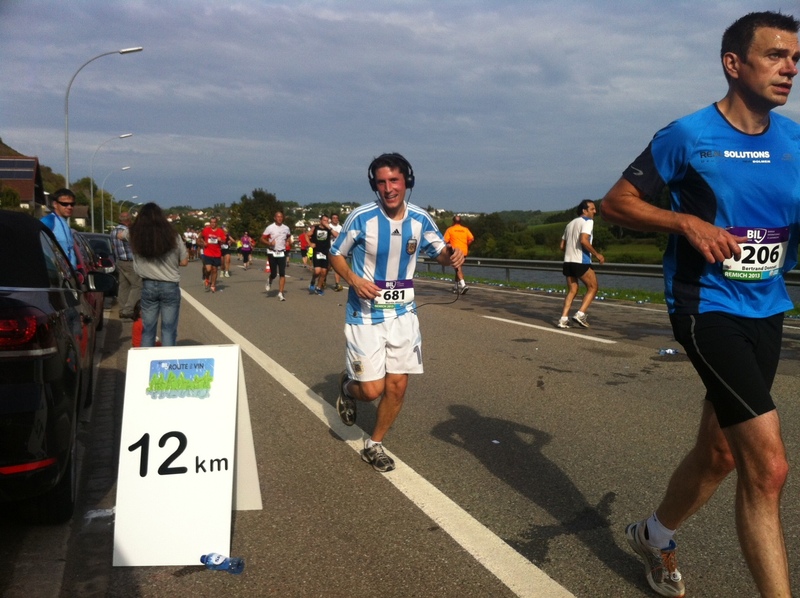 Martín finished 21.1kms in 1 hour 45 minutes and 55 seconds; ten minutes faster than he did his half marathon in Ealing on the same weekend last year. Am I jealous? Very. But more than that, I am proud. When we met, he wasn’t a runner and I convinced him to run one of the famous Nike 10k with me in Buenos Aires (followed by a gin and tonic in Plaza Serrano at 11am on a Sunday morn – ah, those were the days). You do anything for love.